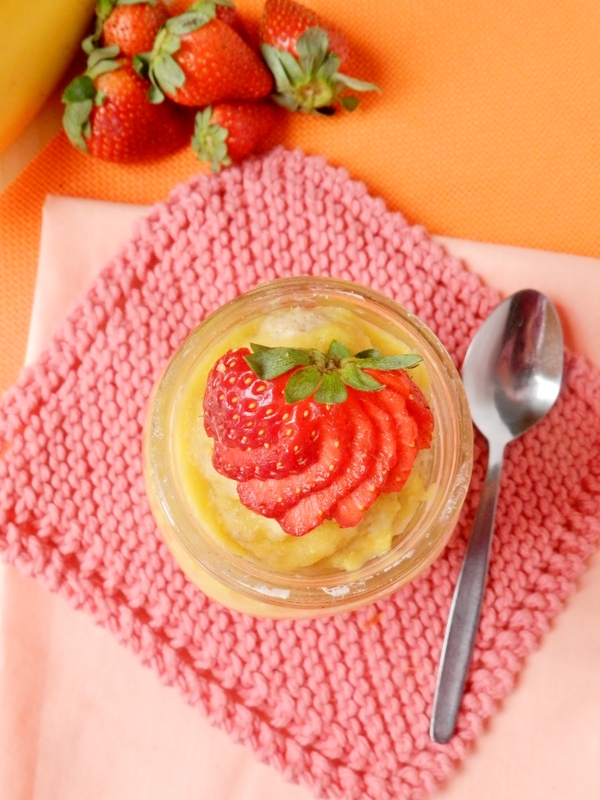 It looks like our springtime and sunshine recipes worked – it is absolutely GORGEOUS out today! A Good Friday Miracle perhaps? There is a lot good about this Friday, too! It’s Easter weekend, so we don’t have class today and are home putting in some serious fam-jam time, there’s chocolate EVERYWHERE, it’s potentially the most beautiful day we’ve had since the fall, and we’re sticking to our promise and giving you more of our pancake-in-a-jar recipes! This has been on of our favourite flavour combinations ever since our dad first brought home a carton of Orange Strawberry Banana Juice. Delicious! This pancake kind of fits in really well with the weather, it’s just so bright and colourful! Needless to say, we are spending partially outside enjoying the day, and partially inside baking several loaves of bread! What’s better than that? 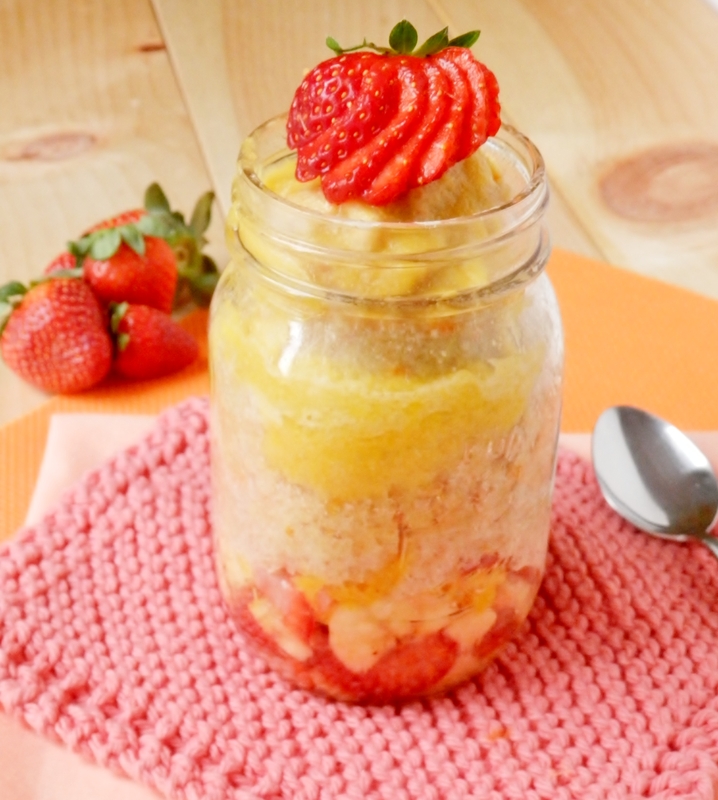 Chop up strawberries and banana and divide evenly into two medium sized mason jars. Zest the orange, squeeze out the juice, and remove the pulp from the rind. 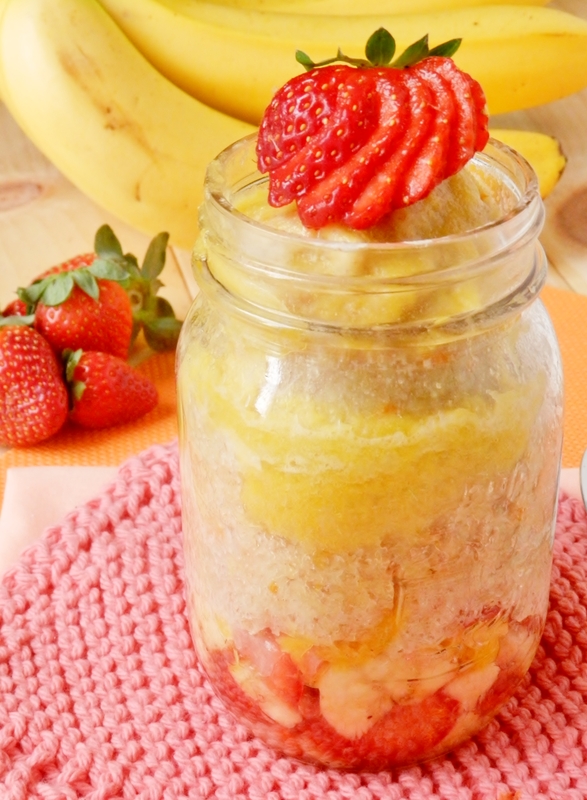 Divide 2 tbsp of the pulp evenly between the two mason jars, mixing with the strawberries and bananas. In a medium sized bowl, combine flour and baking powder. 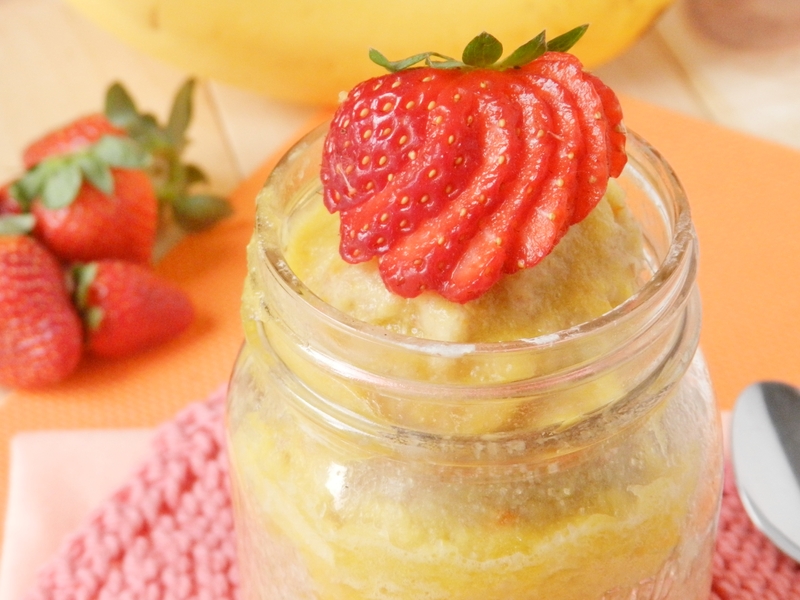 Mix in orange juice, milk, zest and 1 tbsp of orange pulp. 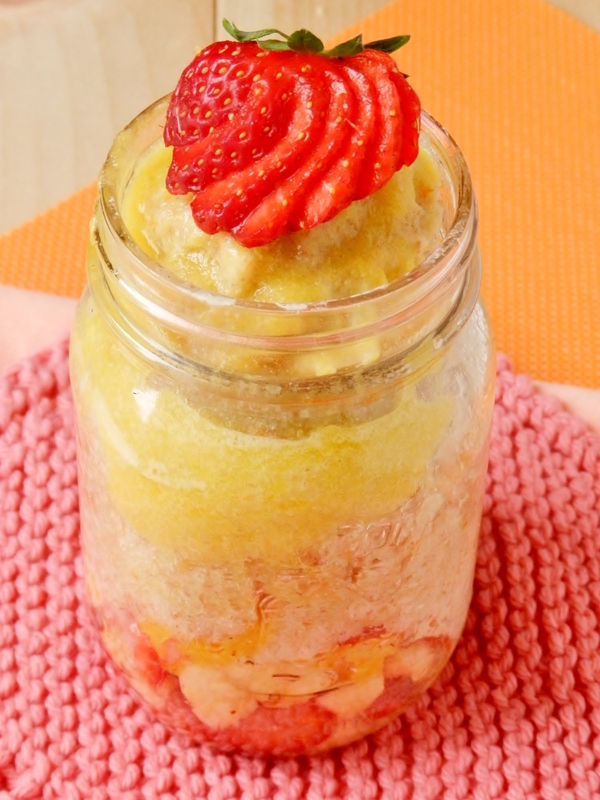 Divide this mixture evenly between the two mason jars and then cook in the microwave for 5 minutes, or until firm to the touch. For the syrup, combine the 1/4 c. of orange pulp and honey in a food processor or blender (we used our spice grinder), then add 1 tbsp of water at a time until you reach your desired consistency. Pour over the top of your pancake and enjoy! What’s good about your good friday? Posted in Uncategorized and tagged banana, banana juice, breakfast, easter tradition, fam jam, flavour combinations, food, good friday, healthy, ingredient, low fat, microwave, orange, orange juice, orange strawberry banana, recipe, sandwich fixings, strawberry, strawberry banana, vegetarian, whole wheat. Bookmark the permalink. It’s one of our favourite breakfasts! So yummy. We originally got the idea from a blog called The Boy and The rabbit.